Wear your support for SAVE! 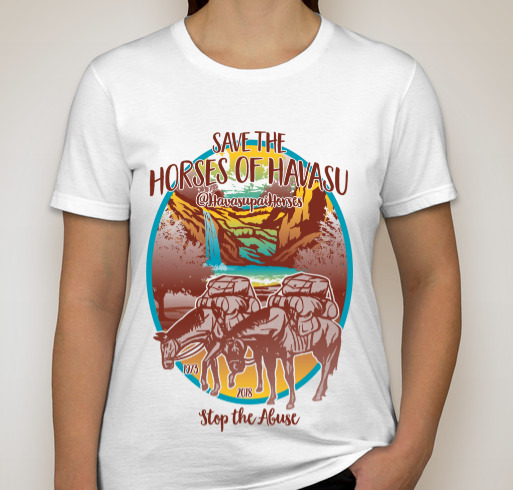 Friends and followers: Custom Ink, a custom t-shirt company, generously offered to create a t-shirt to help raise awareness for the ongoing abuse and neglect of the Havasupai pack animals. A purchase of the t-shirt helps us further spread the word about SAVE’s cause, and the proceeds (after Custom Ink takes a portion to cover their costs) will go to SAVE. Depending on how much money is raised, we will either use the funds for another billboard or put it towards helping fund the documentary. We will keep everyone posted. Please take a moment to visit the Custom Ink website and consider purchasing one of the t-shirts for just $25 for yourself or for a friend. Help us meet our goal of selling 100 t-shirts before the campaign closes. © 2019 SAVE Havasupai Horses. All rights reserved.